The 2016 AHS Special Lecture Series will be held at UNIST Library on May 23rd, 2016. 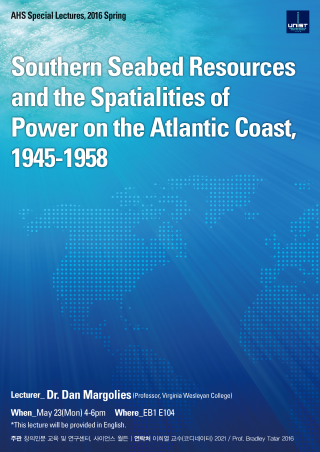 The lecture, entitled “Southern Seabed Resources and the Spatialities of Power on the Atlantic Coast, 1945-1958” will be presented by Dr. Dan Margolies UNIST)from Virginia Wesleyan College. This lecture will be presented in English.